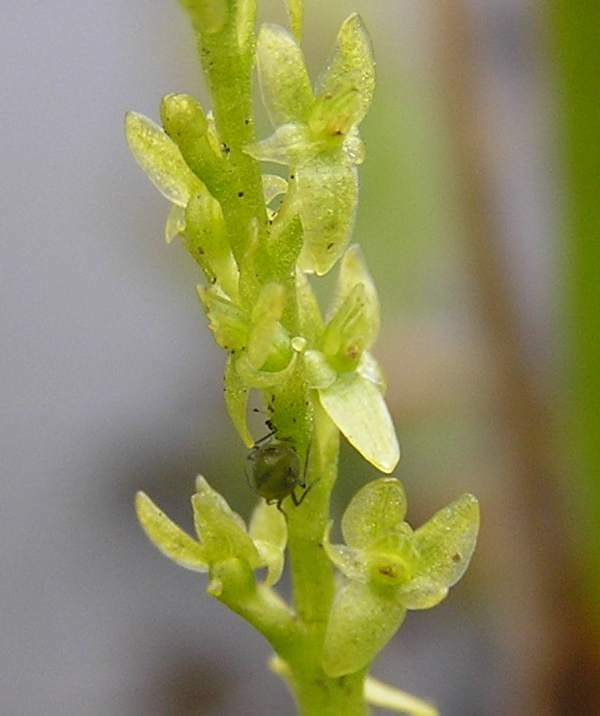 This tiny orchid grows among marsh plants much taller thanitself which makes it very hard to spot. The name Hammarbya refers to the summer home (Hammarby) of Carl Linnaeus the great Swedish botanist. The Bog Orchid is the only member of the genus Hammarbya. The Bog orchid seldom grows taller than 12cm and can be as small as 3cm making it extremely difficult to find. At the base of the plant there are two to foursmall leaves sheathing the stem. The leaves arise from pea-sized swellings called pseudobulbs which are often just above the soil surface. The inforescence is green and carries up to 25 flowers which have a curious almost upside-down appearance. When fully open the flower spike is rather lax. This orchid occurs in quite a widespread range of small sites in the UK and Ireland. It is most common in parts of Scotland and northern England. In Wales it is known from a number of sites including the Elan Valley. The Bog Orchid occurs throughout parts of northern Europe including Scandinavia and Russia, central Europe, south as far as Italy. In Asia it grows in Japan and in North America is occurs from Alaska and south to Minnisota. 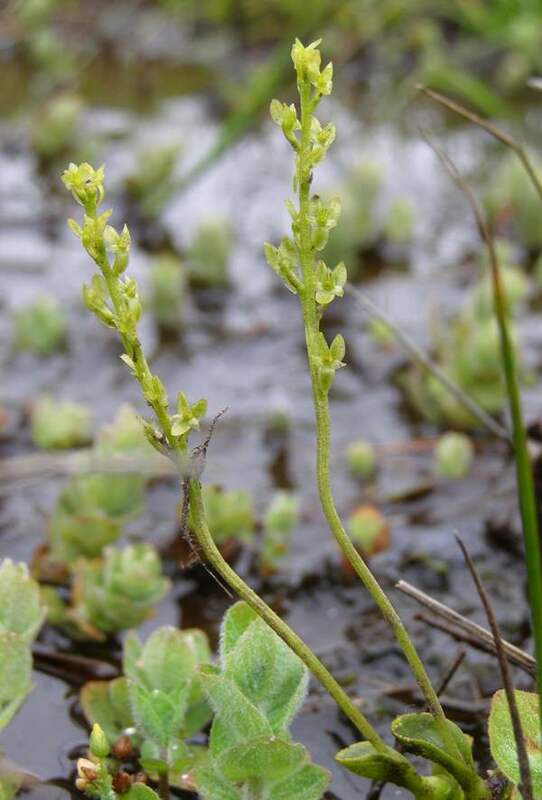 During the summer of 2008, the Bog Orchid was re-discovered at Cwmtwrch in Carmarthenshire, Wales where 34 plants were counted. The Bog Orchid grows on mats of Sphagnum moss and where there is a slow but continous flow of water. They can also be found on seasonal runnels and flushes and prefer acidic soils. Bog Orchid flowers from the end of July to the end of August. The specimens shown on this page were photographed in the Elan Valley Estate in mid Wales at the beginning of August.